In March as the cancer diagnosis hit, Bruce and I went to kiss our sleeping girls good night as part of our usual routine. 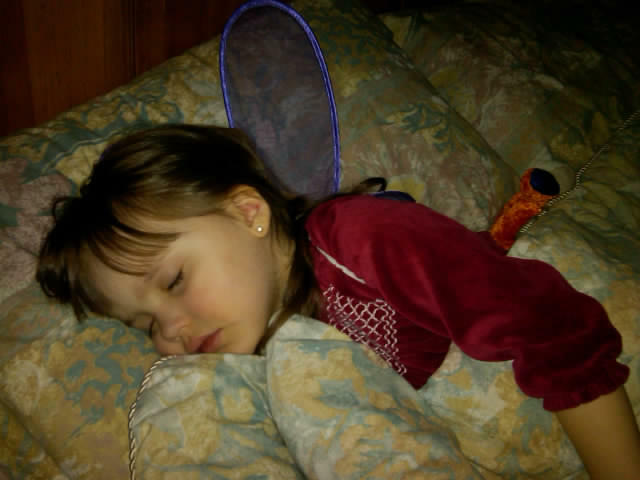 Kristi, our 4 year old was fast asleep with a “set of wings” on to our surprise! An angelic sign to me. 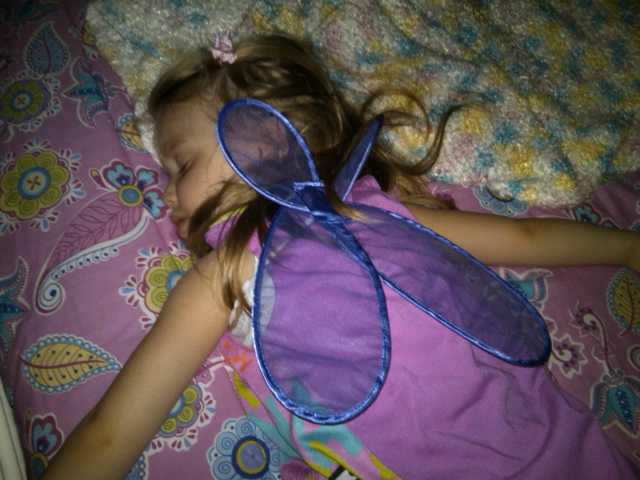 And last night, Kelli our 3 year old, must have found her “wings” after we tucked her in earlier just in pjs!…another sign that made us smile so I thought we’d share this sign with everyone else . Look for the signs, regardless of what you face, they are all around you! So precious Sue! Can’t wait to see all of you. Absolutely adorable Sue! We think of you and keep up to date with you (thanks to CBTD) everyday. Thank you for being such an inspiration to us all. Hope to see you soon. I love your sleeping angels! Hi! Just noticed you added your logo products on the site. Are you donating any portion of the proceeds to the Susan B. Komen foundation or one of the other prominent Breast Cancer Research organizations? Bless their little hearts, they really are such angels. Thanks for sharing such gorgeous pics!